Waterfall is a card game enjoyed by many and is often played as a drinking game at parties. Like most drinking games, the more the merrier, and all you need to play is a deck of cards, some mates and a lot of booze. Because the game often involves copious amounts of drinking, it’s recommended you play with beer, wine coolers or mixed drinks, with straight alcohol a recipe for disaster and a monumental hangover the next morning. To play Waterfall, you’ll need at least four people to make the game really fun and exciting, plus your choice of alcohol and a shuffled deck of cards. The cards are spread out face down in a circular shape in the centre of the table, with each player having their own drink to play the game. Drawing a 2 ‘stands for you’: When a player draws a two they can send two drinks to any other player of their choice. Drawing a 3 ‘stands for me’: The player who draws the card must take three large gulps of their drink. Drawing a 4 ‘stands for floor’: When a player draws a four, every player around the table must point to the floor and say ‘floor’. The last player at the table to do so must drink. Drawing a 5 ‘stands for dive’: Once a five is drawn, all players must dive under the table, with the slowest to do so made to take a drink. Drawing a 6 ‘stands for chicks’: All women playing the game have to take a drink when a six is drawn. Drawing a 7 ‘stands for take seven’: The player who draws the seven sends seven drinks/gulps to another player, or splits up the seven drinks to multiple players at the table. Drawing an 8 ‘stands for whatever you make’: The player who draws the eight can make up the rules for who drinks. For example, you could ask everyone to name a breed of dog, with the person failing to do so required to have a gulp of their beverage. Drawing a 9 ‘stands for rhyme’: When drawing a nine, the player says a sentence to another player who must answer back with something which rhymes with the first sentence. This continues back and forth until someone fails to rhyme, with that person taking a drink. Drawing a 10 ‘stands for drinks with friends’: All players must take a swig of their drink together. Drawing a Jack ‘stands for assholes’: It’s time for all of the boys playing to take a drink. Drawing a Queen ‘stands for question’ The player who draws the Queen must pick another player and they must engage in a conversation only using questions. The player who takes too long to respond or fails to ask a question in response must drink. Drawing a King ‘stands for Kings Rule’ The player who draws a king can make up their own rule which can only be cancelled by another player when drawing a king. Drawing an Ace ‘stands for Waterfall’ These are the cards everyone waits for. Starting with the person who drew the card, everyone begins drinking in a clockwise fashion. When the player who drew the card stops drinking only the player on his or her left can stop drinking, with this continuing around the table until everyone has stopped drinking one-by-one. The game stops when the deck or alcohol runs out. 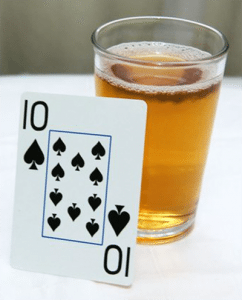 It’s important to note that there are a couple of variations of the game, with some people having different rhymes for each card number, resulting in players drinking differently. For example, another common rhyme is ‘six for dicks’ with all guys playing the game required to drink, rather than a Jack as mentioned above. Can you play Waterfall at a casino? Unfortunately, casinos have to stick to the responsible service of alcohol laws around the country, meaning Waterfall is not a game you can play at a land-based casino. Additionally, it’s not a game available at online casinos, as it’s considered a party game and not something which can be easily wagered on. However, there are a multitude of other card games you can check out such as blackjack, baccarat or poker. And, if it helps you enjoy yourself more, we are sure there is a way to devise your own drinking system playing these popular card games, so sit back, crack open a few coldies and get ready to play. Card games are the main event at online casinos. However, these are no longer available to Australians due to the gambling reforms effective as of September, 2017 which ban Aussies from online gambling sites. Our top-rated sites also have a lucrative welcome bonus for new players and can be enjoyed directly through the Web browser on your computer or mobile, meaning there is no need to download anything which could effect your device. Sign up to play real money card games including blackjack, baccarat and poker at Casino-Mate, our top rated casino for AUD card games, and receive up to $1400 in welcome bonuses spread over your first few real money deposits.